Location of 2011 areas of landsliding in Utah. 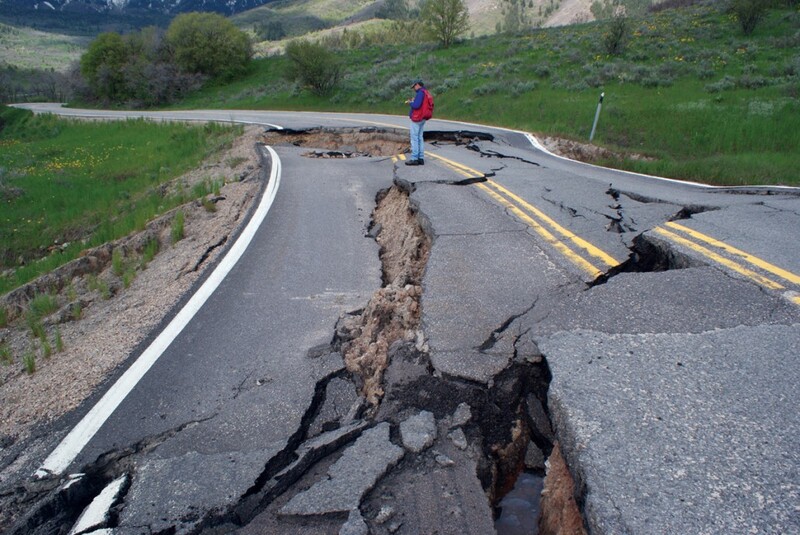 Above-normal precipitation during 2011 triggered landslide movement in many areas throughout Utah, and the UGS Geologic Hazards Program assisted several local government agencies with emergency response for landslide problems. Significant economic loss resulted where landslides damaged homes, underground utilities, highways, and roads. The 2011 landslides followed patterns of previous landsliding during years with above-normal precipitation. Many landslides were reactivations of preexisting landslides and many had moved previously during the wet years of 1982–83, 1997–98, and 2004–05. Mountain snowpacks in 2011 were 300 to 400 percent of average in many areas. Many 2011 snowpacks contained more water than 1983 snowpacks, which melted rapidly and triggered numerous landslides and produced widespread flooding. Surprisingly, the 2011 snowmelt triggered fewer landslides than the 1983 snowmelt. In the Wasatch Range east of Farmington, the 1983 snowmelt produced 57 inches of water in 35 days in one rapid continuous melt period. In contrast, the 2011 snowmelt produced 67 inches of water in 60 days during several melt periods. Cool spring temperatures combined with multiple, short duration melt periods resulted in a longer and slower release of melt water from the 2011 snowpack compared to the rapid melt water release from the 1983 snowpack. 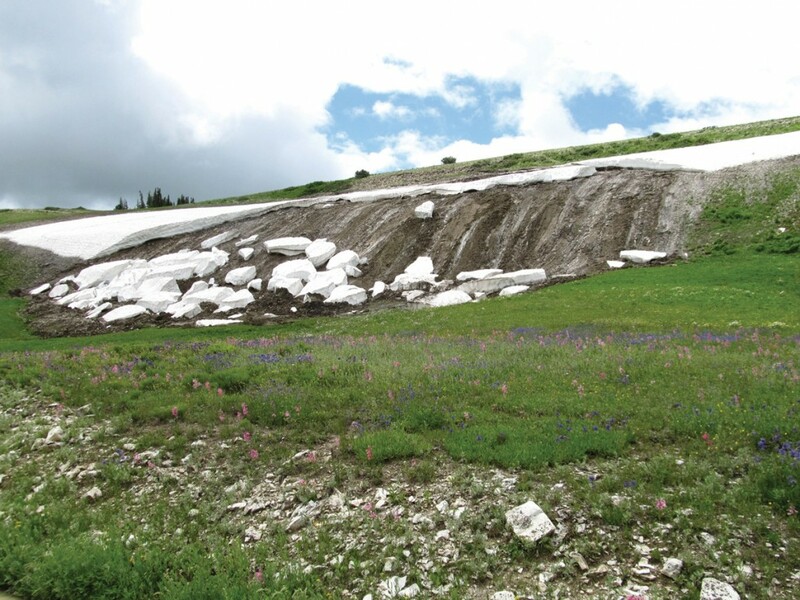 However, snowmelt from the record or near record 2011 mountain snowpacks triggered many landslides throughout Utah that are visible on 2011 statewide National Agricultural Imagery Program aerial photography taken later in the year. Many of these landslides are shallow landslides that were triggered at or near the end of snowmelt, such as the landslide that stripped trees from the mountainside, closed a road, and partially blocked the creek in Brownie Canyon, 17 miles northwest of Vernal. Some landslides started moving before the overlying snowpack had melted. 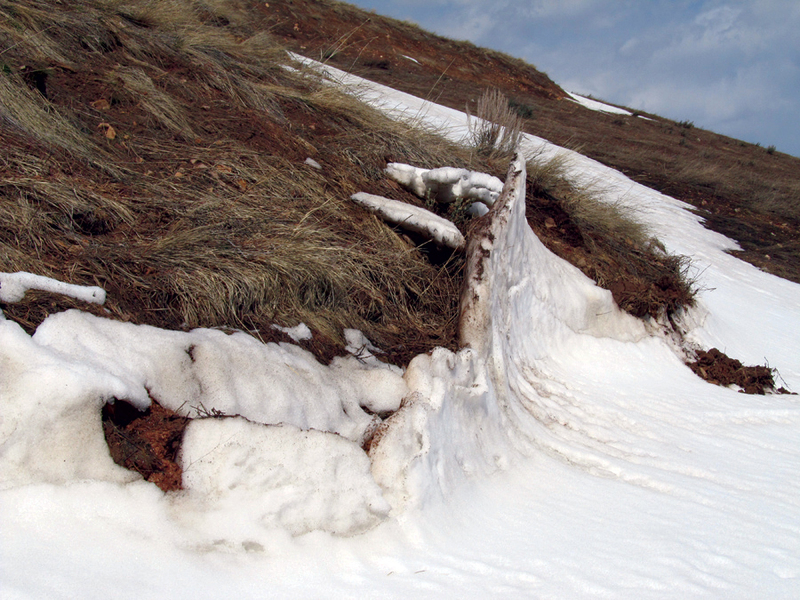 Movement of these landslides deformed or fractured the overlying snowpack. In northern Utah, many landslides reactivated around the Snowbasin area. The upper part of the Bear Wallow landslide above State Route (SR) 226 (Snowbasin Road) moved 11 inches, which is almost as much as the observed 12 inches of combined movement from 2005 through 2010. The Green Pond landslide damaged SR-226 and a culvert under the road. The old Snowbasin Road, which is closed during the winter, was severely damaged by several landslides, including one that completely destroyed the road. Many landslides along SR-167 (Trappers Loop Road) also reactivated. 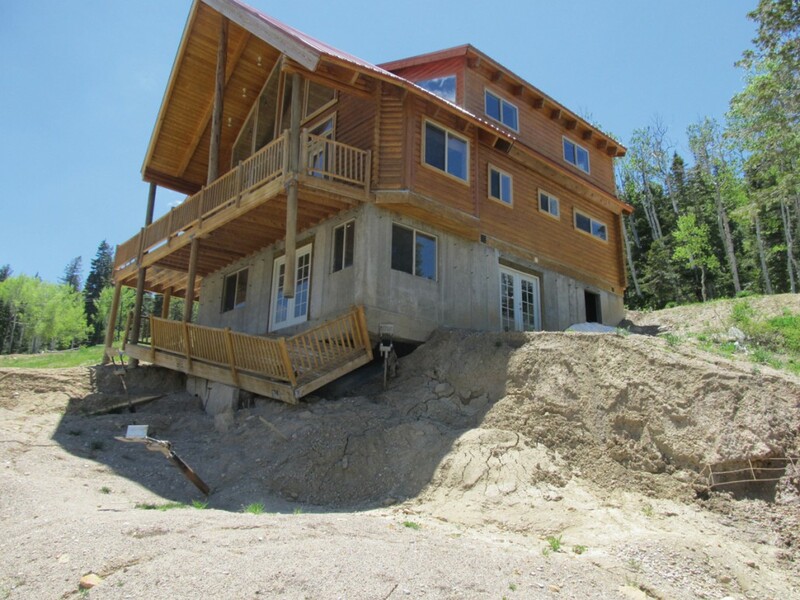 South of Snowbasin in Mountain Green several landslides reactivated, causing further damage to houses already damaged by landsliding. Landslides also ruptured a culinary water line and damaged subdivision roads in Mountain Green. All of these landslides involve the Norwood Tuff, a clay-rich geologic unit that is widely recognized for producing landslides. Elsewhere in northern Utah, the Chalk Creek Narrows landslide east of Coalville reactivated and threatened to block the creek. The landslide moved 3 to 6 feet into the creek, but high stream flows eroded the landslide toe as it advanced and kept the landslide from damming the creek. In North Salt Lake, another house was demolished on the Springhill Drive landslide due to distress from continued slow landslide movement. Landslides were also active in the Sherwood Hills area of Provo. Many landslides also occurred in southern Utah. The largest and most impressive landslide was the October 8 landslide that destroyed a section of State Route 14 in Cedar Canyon east of Cedar City (see article in this issue). Previous landslides in this area have also closed the highway. Farther east up Cedar Canyon, landslides damaged several houses in the Woods Ranch area. Movement in part of the Green Hollow landslide on Cedar Mountain southeast of Cedar City continued to damage property within the Cedar Highlands subdivision. 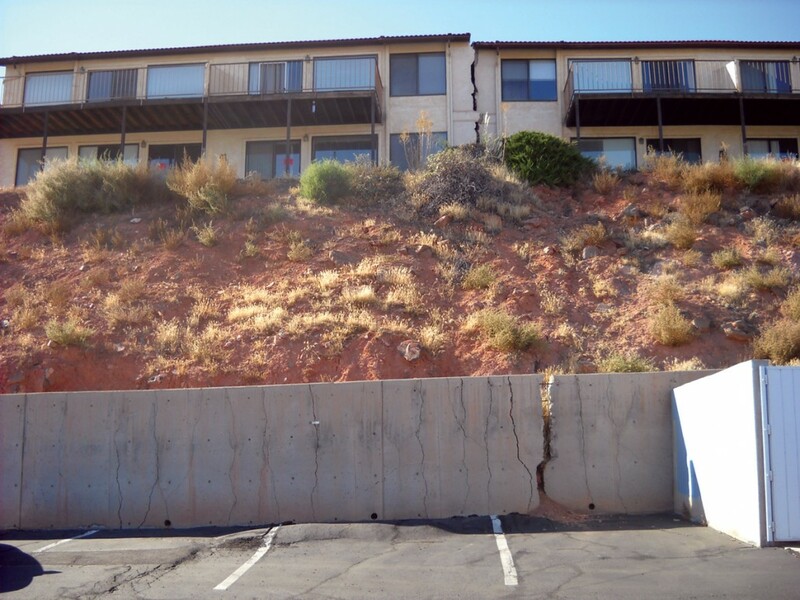 The Garden South landslide in St. George has moved slowly for several years, and accelerated landslide movement in 2011 further damaged condominium units, a motel, a restaurant, parking lots, and a retaining wall. Years with above-normal precipitation like 2011 continue to show Utah’s vulnerability to landslides and the associated economic losses. Communities that have developed areas on landslides continue to face difficult challenges when landslides damage commercial buildings, houses, and public infrastructure. The 2011 landslides provide important lessons on how to manage active landslides, where to build safely, and how to plan for landslide hazards. The UGS continues to map landslides, document historical landslide events, and monitor groundwater and landslide movement in select areas to aid in reducing landslide hazards in Utah.